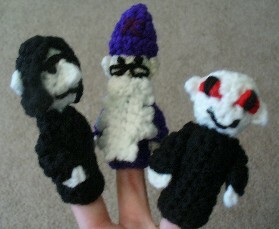 Dumbledore, Voldemort and Snape are now cuter than ever as these adorable finger puppets! If you're a fan of the Potter Puppet Pals, then you're going to love this pattern - and if you're a Harry Potter fan, and you aren't familiar with the Potter Puppet Pals - well, go check them out. Seriously, this'll wait. Now you can make your own miniature versions of Voldy, Snape, and Dumbledore, to help you re-enact your favorite episode or come up with your own zany adventures. Were you hoping to find directions for Harry Potter, Ron, and Hermione? They're over here! One or all of these awesome finger puppets would make a great gift for yoursel - I mean, for you favorite little Harry Potter fan. Yeah. That's totally what I meant.